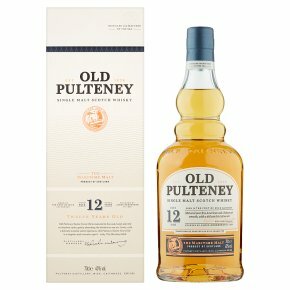 The Old Pulteney distillery overlooks the harbour and you can almost believe the whisky has taken on some of the sea's character. It's an elegant Highland malt showing a deep amber colour with a pink hue. With floral and citrus notes, it's bright and has a subtle sweetness from the use of former bourbon casks. The maritime malt. Born in the port of wick Caithness. Distilled and matured by the sea. Our Twelve Years Old is matured next to the sea exclusively in fine American oak ex-bourbon casks. Flickering from amber to gold and copper on the eye, subtly intense waves of fresh brine, toffee and salty sea air recollect the Caithness coastline, with honey, vanilla and spicy fruit washing across the palette in a faintly salty, long-lasting finish.